Nigerians in the state under whatever guise. The command’s Public Relations Officer, Mr. Ebere Amaraizu, gave the warning in a statement in Enugu on Monday. Amaraizu said that the police would arrest anyone caught committing any offense under the guise of masquerade shows. He said that the command had continued to say that people’s rights should not be infringed upon in any show or festivity. 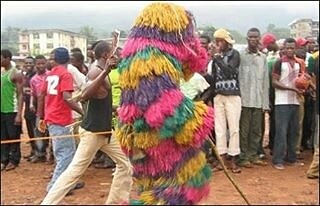 He advised communities to celebrate their culture and masquerade festivities within the confines of the law. “The Police have frowned at the report received concerning the alleged recklessness of some masquerades and their assistants on the issue of assault, molestation, and intimidation of good people of the state. “Anyone caught committing offense or wrecking havoc on members of the public under the guise of masquerade festivities will be promptly arrested and prosecuted,’’ he said. In a related development, the command through its operatives in Nsukka Police Divisional Headquarters has nabbed one of the assistants of Oriokpa Masquerade, Nnamdi Okoro, in Nsukka on March 26.